DJ & Nisha Sardellla tour the Sequatchie Valley Aug. 3, 2018. The valley is the first area included in a new region cycling initiative (Contributed photo by Shannon Burke). 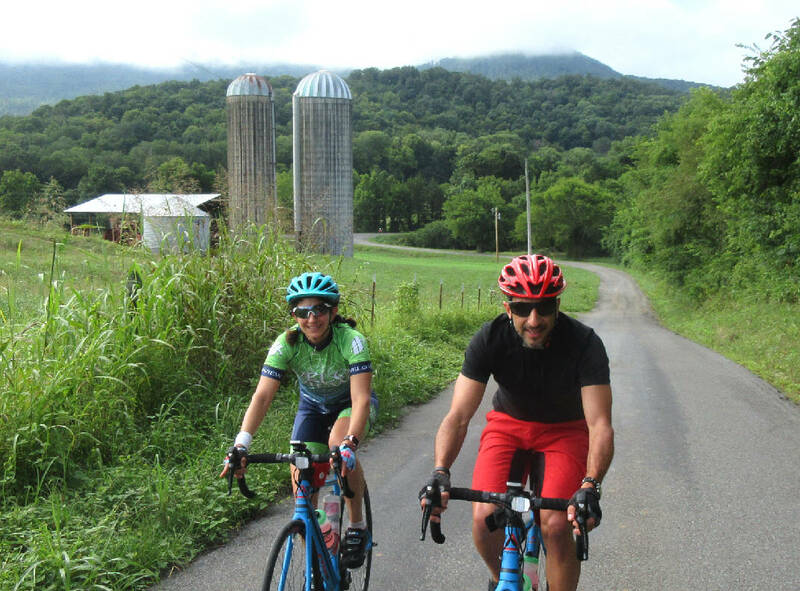 Chattanooga's locally backed cycling event is moving away from the city to the Sequatchie Valley to ensure sustainability while appealing to a broader audience. The news dashes any hopes for a 3 State 3 Mountain ride resurgence, but it gives the region a ride organized by local cyclists. The new ride, Cycle Sequatchie, will be Oct. 5 and take the place of last year's Chattanooga Challenge. The event will be put on in tandem by Velo View Bike Tours and the Chattanooga Bicycle Club. "The Chattanooga Challenge last year was a lot of fun, but I felt like it might run into a similar fate as 3 State given the traffic control requirements to make it work. It was also hard to find appealing short- route options to add to the menu given the urban start location," event director Shannon Burke, owner of Velo View, wrote in an email. For several years, a local cycling event had been in limbo as Chattanooga Bicycle Club members debated the future of the 3 State 3 Mountain ride, which drew a couple thousand cyclists annually during its peak years. The event was a staple of the region's cycling calendar for 30 years but ended in 2017 after much back-and-forth within the club. In the event's absence, Burke launched the Chattanooga Challenge. The ride featured a sunrise climb up Lookout Mountain via Ochs Highway with 100- and 50- mile route options. It had 250 riders in its inaugural year but largely featured Burke working by himself to find sponsors and pull off the event. In the meantime, there was major turnover at the top of the bicycle club. New leaders wanted to continue offering a locally produced ride at an affordable price that highlighted the area's scenery. "I feel like 3 State was the backbone of the bike club," longtime club member and communications director Daisy Blanton said. "I'm not sure anything is going to replace it, but I understand there were problems with 3 State I think the majority of the club has moved on. We're getting some new people — people with good ideas." Burke and the bike club talked about partnering for the Chattanooga Challenge. Both wanted to see a locally produced annual ride succeed. However, the club was still figuring out what direction it wanted to take while ushering in new leadership. "We had talked last year with the Chattanooga Bicycle Club about partnering with us," Burke said. "It was a bit informal with the Chattanooga Challenge because we had a short timeline, but as were talking about that, we were also looking down the road at possibly bringing 3 State back or doing another right. With this much lead time, it has helped get them more involved to give us a little more momentum and manpower." The two came together and launched this year's event. The bike club offered its resources — such as its database of past 3 State 3 Mountain participants — and years of event experience to help Burke continue putting on an event that draws both locals and people throughout the Tennessee Valley. The club wants to continue its goal of getting area residents interested in the leisure activity while teaching safe riding. "We hope to make it the signature event for the club, but if we could really make it the premier ride for the tri-state area, that'd be great," club president Joe Lodato said. The ride partnered with the Land Trust For Tennessee to further conservation efforts across the region. A move away from the city also gives organizers the ability to offer more routes. Last year's ride started at Finley Stadium and featured only the 50- and 100-mile loops. Shorter rides were harder to organize in a downtown setting. This year's event has 16-, 37-, 63- and 78-mile loops and a farm-to-table buffet provided by Sequatchie Cove Farm after the ride. "Sequatchie is beautiful; it's beautiful riding," Blanton said. "It'll be a rural ride, and there will be support that way. I can't say anything bad about it. It's nice; it's good. I think it will be popular, I hope." Registration is open at CycleSequatchie.com. Registration costs $40 for the first 40 people. From there, it costs $50 through Memorial Day, $65 between Memorial Day and Sept. 15, $75 for late registration between Sept. 15 and Sept. 30, and $80 cash only for those who register on the day of the event. The event will include an outdoor expo with local retailers, outdoor recreation groups and conservation organizations. Interested organizations are asked to contact Burke at shannon@veloviewbiketours.com. Contact staff writer Mark Pace at mpace@timesfreepress.com or 423-757-6659. Follow him on Twitter @themarkpace and on Facebook at ChattanoogaOutdoorsTFP.